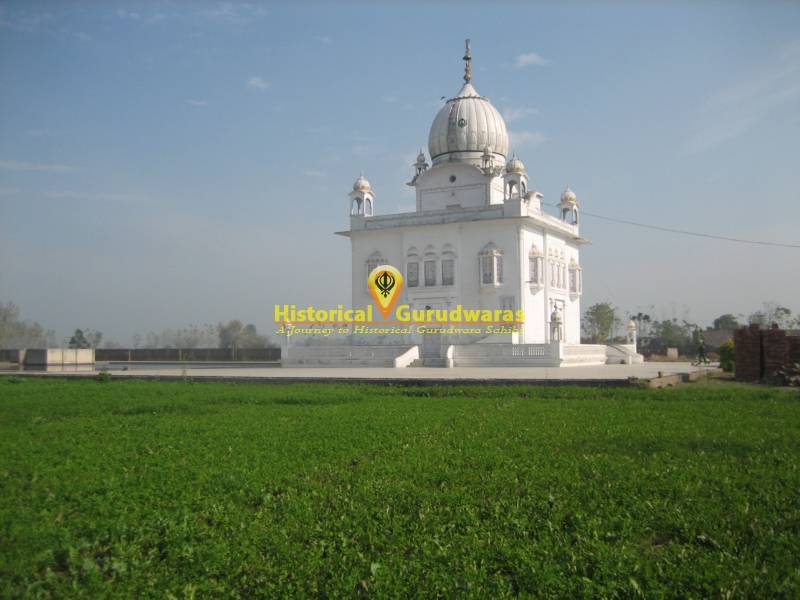 GURUDWARA SHRI AMB SAHIB is situated in the Bhairowal Village of Tarn Taran Distt. 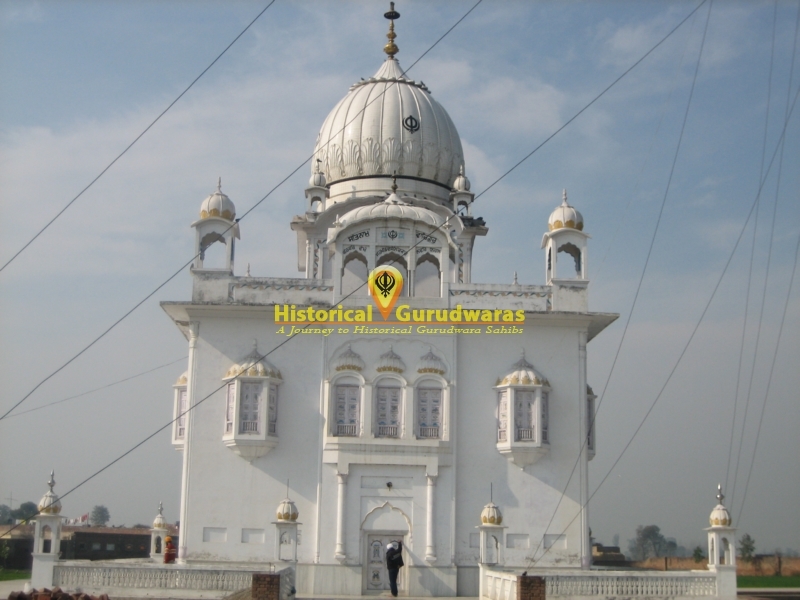 When Emperor Akbar came to Lahore, the Khatris & Brahmins went to him & complained that SHRI GURU AMARDASS JI at Goindwal Sahib has started a new religion by giving up the old scriptures & customs. He doesn\"t even know that the great hymn from Hindu scriptures is Gayatri & neither does he recite the same. He has made his own religious scripture & recites that only. He has created a danger to the Hindu religion. On listening to their complaint, Akbar said that they need not worry as he will speak to GURU JI & get them justice. After this Akbar sent a message to GURU SAHIB stating that the Khatris & Brahmins are complaining against Him & He should come to Lahore & give an answer to their complaints. 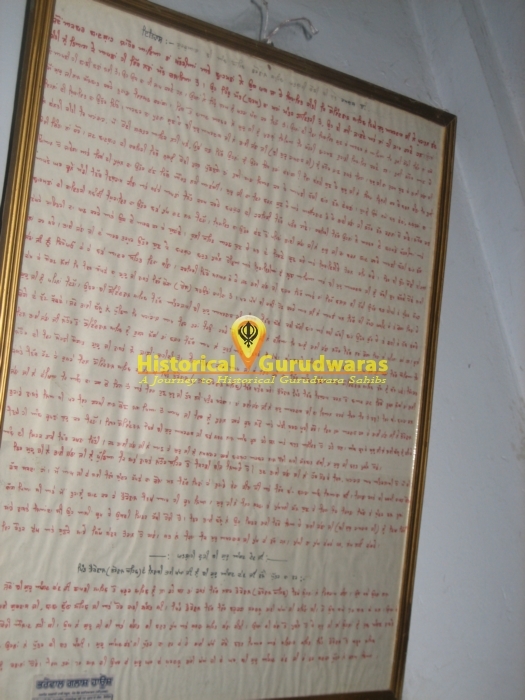 On hearing Akbar\"s message, SHRI GURU AMARDASS JI asked BHAI JETHA JI (SHRI GURU RAMDASS JI) to go to Lahore. On listening GURU SAHIB\"s order, BHAI JETHA JI requested that he had not studied any Shastras so how would he give answers to the questions asked in the meeting. On listening to his request GURU SAHIB, with his kindness, said that He need not worry. In the court of the Emperor, whenever someone asks you a question, you start thinking about me & look towards your right arm. You will get the knowledge about all the Vedas & Shastras & you would be able to answer any question without any difficulty. On hearing this & after getting GURU SAHIB\"s blessings, BHAI JETHA JI started his journey to Lahore. At night, He took rest at his house in Choona Mandi Lahore & the next morning, after offering prayers, he went to the Emperor\"s court. In the court, in presence of Akbar, he gave an answer to the complaints of Khatris & Brahmans regarding Gayatri, in a very peaceful manner. Before giving an answer to the complaint, BHAI JETHA JI recalled the words told to him by GURU SAHIB & while looking towards his right arm, he recited the Gayatri prayers & then also explained there meaning. After hearing the meanings with vocals, everyone & even the complainants were amazed & were not able to ask any question. After listening to meaning filled answer given by BHAI JETHA JI, the Emperor got very happy & pointed the complainants as liers & while commenting SHRI GURU AMARDASS JI as heavenly figure, presented a robe of honor to BHAI JETHA JI before bidding him farewell respectfully. After getting respect from the court, when BHAI JETHA JI was passing through the market, he saw a very beautiful & expensive cloth at one of the shops & started to think that he should get a gown sewn for GURU JI out of this cloth. But due to less money, BHAI JI got the cloth purchased & gown sewn for GURU SAHIB in his desires only. 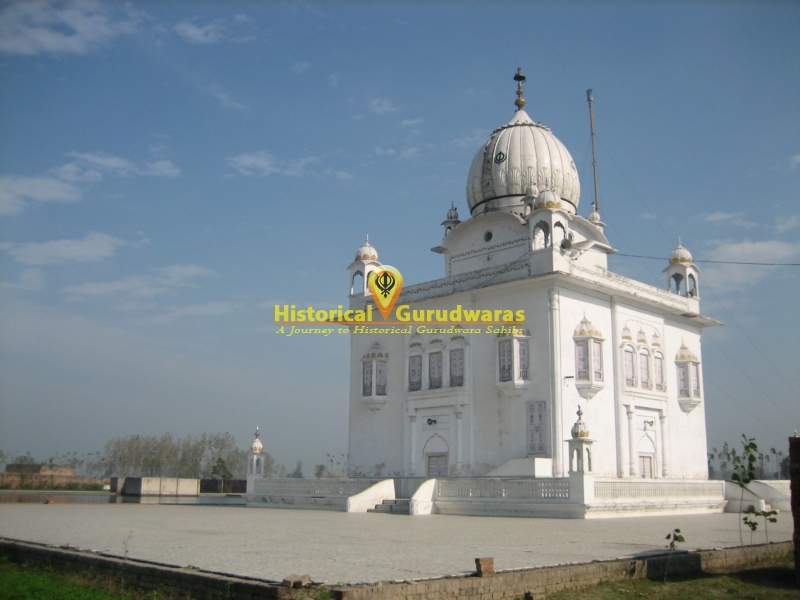 On the other hand, SHRI GURU AMARDASS JI while sitting in the royal court at SHRI GOINDWAL SAHIB, was moving his arms over his chest in order to remove wrinkles from the gown. When Bhai Ballu Ji inquired about that Maharaj, why are you doing so ? GURU SAHIB replied that BHAI JETHA JI got him a gown sewn from Lahore & he was getting him to wear it. The next day when BHAI JETHA JI started from Lahore to Goindwal Sahib, he saw unseasonable mango\"s being sold in the market. Looking at the beauty of unseasonable mango\"s, BHAI JI thought that this beautiful gift from Lahore should be taken for GURU SAHIB. After this thought, BHAI JI bought a mango for one rupee & started towards Goindwal Sahib. 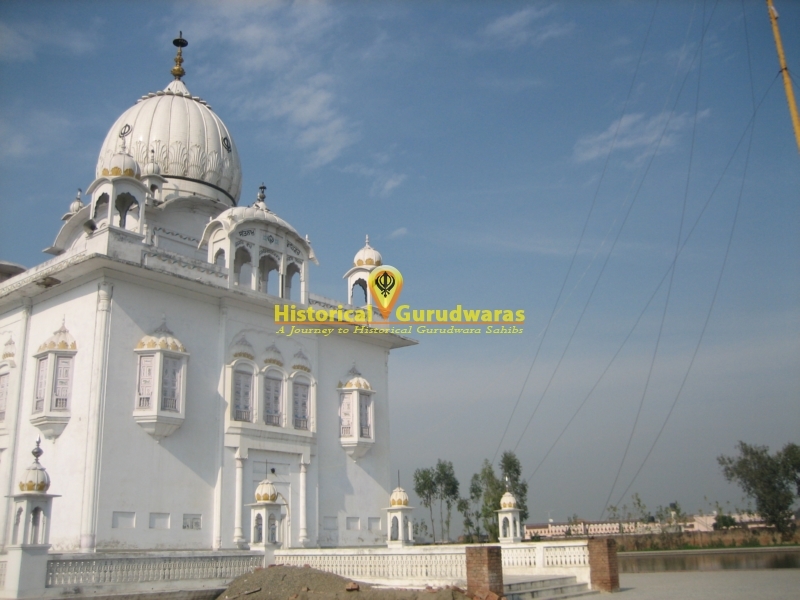 After spending a night on the way, he reached village Bhairowal ( Now known as BHAIROWAL SAHIB) near Goindwal Sahib. After taking rest at Bhairowal village, when BHAI JI started his journey again, But he noticed that the juice started flowing from the mango & the mango might not reach GURU JI. BHAI JETHA JI started to think about SHRI GURU AMARDASS JI & said \" Hey GOD, this unseasonable mango was bought for you but due to the hot weather, this fruit has started dripping. Kindly accept it & eat it & fulfill my desire\". Like this, after offering prayers, BHAI JETHA JI started to eat the mango at Bhairowal only. 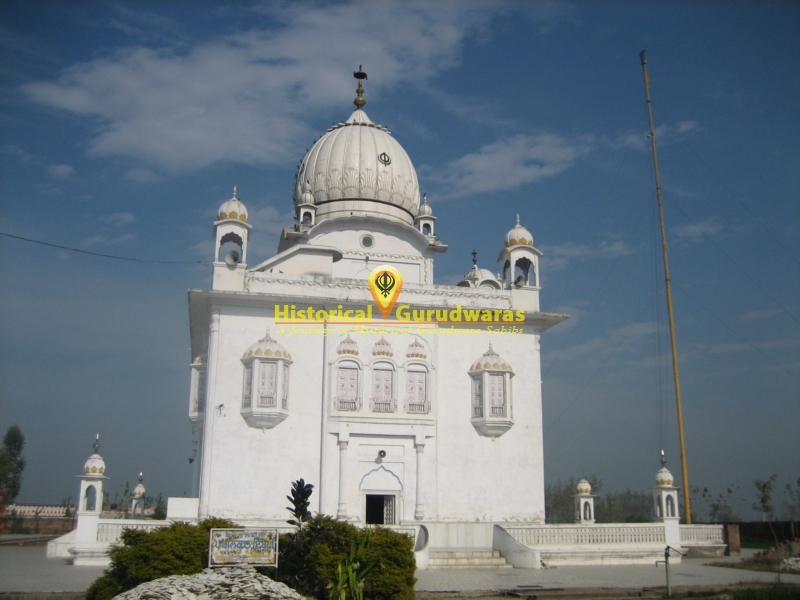 At the other end, SHRI GURU RAMDASS JI was eating the mango & enjoying it at Goindwal Sahib. After eating the mango, GURU SAHIB asked Bhai Billu to keep the seed in the window. When BHAI JETHA JI came and told GURU SAHIB about the whole story which happened with Akbar, he was very pleased to know about it. Then GURU SAHIB asked that what had he brought from Lahore city for him to which BHAI JETHA JI replied with folded hands \" You are divine, What can I say? I had bought a beautiful piece of cloth for you & got it stitched for your in my heart only & I also bought a unseasonal mango which started dripping due to heat & I ate it by remembering you at Bhairowal.\" GURU SAHIB after listening to this desire & story said that he had eaten the sweet & beautiful fruit that he had brought for him & has kept the seed. Then Bhai Ballu Ji brought the seed from the window & showed it to BHAI JETHA JI (SHRI GURU RAMDASS JI). After hearing & looking at this miracle, the Sikh followers were amazed & said that SHRI GURU AMARDASS JI is follows Love. He looks towards the person\"s love & not his name. 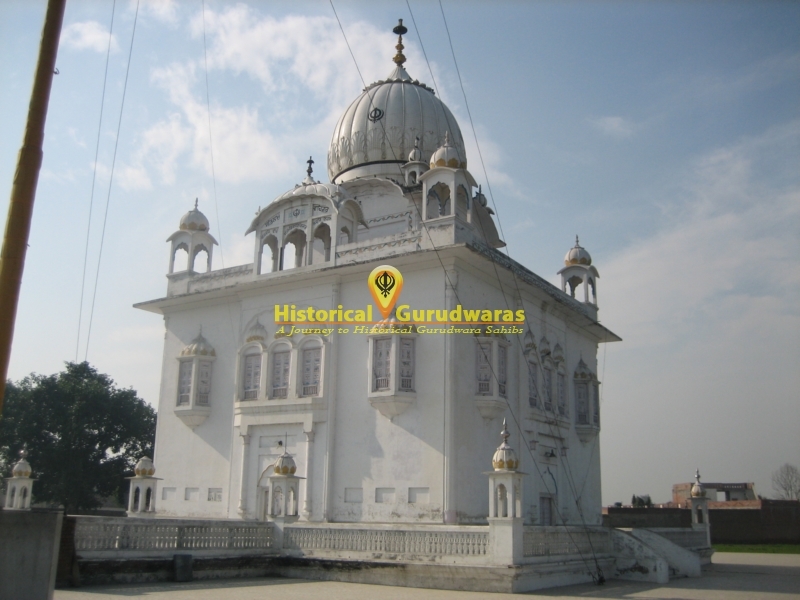 When SHRI GURU ANGAD DEV JI was going from CHAAPRI SAHIB to KHADOOR SAHIB, on the way He took rest at Bhairowal town (Bhairowal Sahib). There were many Sikh followers including BHAI GURDASS JI & BABA BUDDA JI. There was an old Sikh follower whose age was 70 years, Bhai Khema Ji, who used to stay in Village Bhairowal. He had no children. He served GURU SAHIB & his followers with a great zeal. 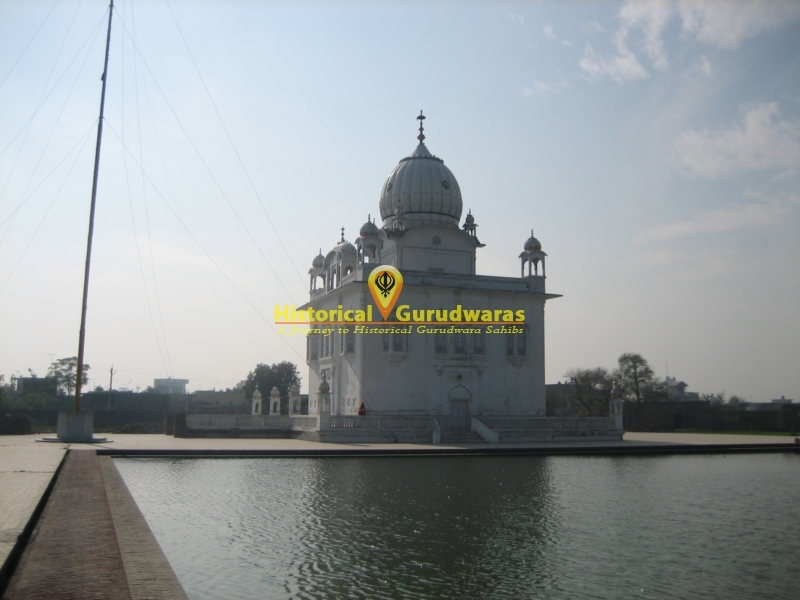 Pleased with his service, GURU SAHIB asked him his wish to which he said that he wanted a son. GURU JI gave a boon to Bhai Khema for a son & respectfully started his journey from Bhairowal to KHADOOR SAHIB. Like this, at the age of 70, the Sikh follower Bhai Khema Ji was blessed with a son as a result of boon given by SHRI GURU ANGAD DEV JI.